By now, you’ve all started school. How about making a plan this year to befriend someone new? Include someone in your group plans, eat lunch with someone who doesn’t have anyone to sit with. You never know what a difference you could make in their life. My website is now up and running! Yay! Spread the word, and let’s change lives! I’m excited for this journey, and I hope you’ll all come along with me. Lots of things coming up soon, so stay tuned! 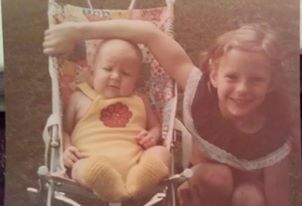 Here’s a photo of me (the chunky baby) and my amazing sister, Michelle!